Wales and Ireland, a game that lived up to its reputation as the craziest fixture in international rugby, producing an away win for the 14th time in 17 seasons. Ireland were bidding for the runners-up spot and for their first four match winning run since their grand slam season of 1948. But they saw a memorable season end in anti-climax as Neil Jenkins came off the bench to kick Wales to victory with two late penalties. A fiercely fought fluctuating contest ended suitably with Ireland hamnmering at the Welsh line. 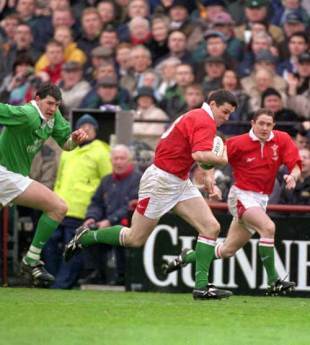 Ireland had looked certain losers when Steve Jones crossed to give Wales an 11 point lead early in the second half. But the setback seemed to inspire Ireland who dominated the next half-hour with Anthony Foley driving fiercely from No.8 and centre Brian O'Driscoll, invisible in the first half, creating panic every time he touched the ball. Ronan O'Gara cut the gap with his third penalty of the afternoon. Then superb work by scrum-half Peter Stringer, timing his flat pass to perfection created space for giant winger Shane Horgan to crash over in the corner, driving through Welsh fullback Rhys Williams. O'Gara converted from the touchline then kicked Ireland into the lead after a further spell of intense pressure. If Rob Henderson had held O'Driscoll's pass after his fellow centre had sliced through with less than ten minutes to go, Ireland must have won. Instead the stage was set for Jenkins, playing on the ground where he re-launched his international career with a match winning display two years ago, to thwart Ireland again.. The match had started in conditions Ireland would once have regarded as ideal - wet and windy - although it was less clear whether this would suit this season's more fluent style. And the Irish took early control with O'Gara rifling a series of long rolling kicks deep into the Welsh 22 then landing two penalties as Wales offended under pressure, a third attempt from halfway, fell short. Ireland also took the opportunity to test out Wales's 20-year-old debutant fullback Rhys Williams. If they hoped the Cardiff youngster would be vulnerable on the basis of his Gwyneth Paltrow impersonation during the anthems, they were disappointed. Williams fielded his first test, a towering up and under, coolly before taking a quick tap from the mark and launching his three-quarters. His first 40 minutes of international rugby lived up to this initial promise, defending coolly and looking Wales's most dangerous attacker as he took advantage of wayward Irish kicking to run sinuously from his own half. Momentum swung strongly midway through the first half. Shane Williams was impeded chasing a long kick from Geraint Lewis. Wales kicked touch, Andy Moore won the lineout and flanker Nathan Budgett crashed over for his first international try. Jones conversion gave Wales a single point lead and the Welsh with their forwards clearly on top took control of the second quarter. Jones kicked them further into the lead with a 34 minute penalty but his miss from a simple position in front of the posts in injury time kept the half-time margin down to four points.